New additions and emerging talents expected to play key role in front of veteran quarterback Miles Richardson. 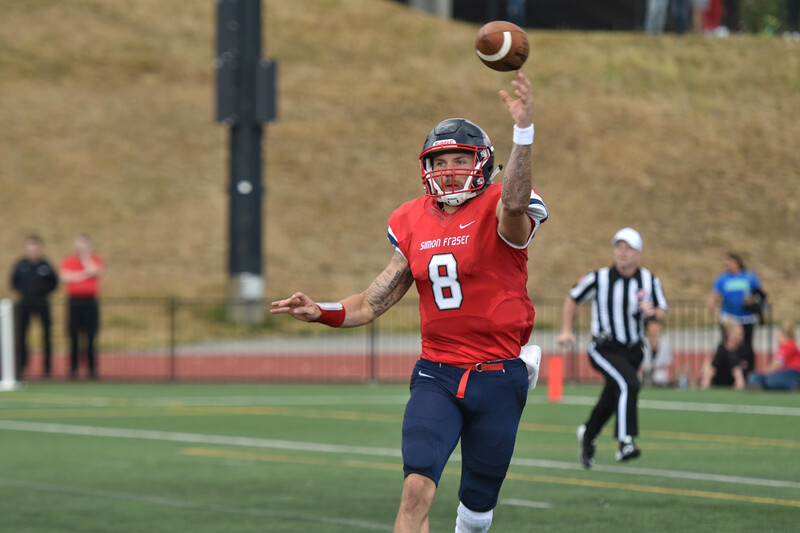 BURNABY, BC – The Simon Fraser University football team is ready to put the past behind them and begin a new era under incoming head coach Thomas Ford. With training camp in full swing and the 2018 season home opener just over a week away, the new Clan boss is champing at the bit to give fans a reason to cheer. While Ford knows that there is no hiding from the program’s recent shortcomings, his top message to his players in camp has been to look forward. Simon Fraser has gone winless in their last three seasons and are on a 33-game losing streak. For now, however, Ford’s team has a perfect 2018 record and he fully believes that they have the talent on offence to be competitive against any team in the Great Northwest Athletic Conference. While not a new tactic in collegiate football, or even at Simon Fraser, the run pass option is a scheme in which there are multiple running or passing options set up, but the decision isn’t made until the ball is snapped. A potentially “undefendable” play, it takes a skilled quarterback to pull it off. Ford believes he has that in Miles Richardson. A redshirted senior, Richardson is entering his third season with the Clan and threw 10 touchdowns last season while also rushing in three. He will be counted on to provide leadership for an offensive group that includes many younger players looking to have breakout campaigns. According to Ford, the team’s main receiving target should be junior Rysen John and he also has high hopes for junior tailback Jason Nelson, a transfer from San Joaquin Delta College in Stockton, California. John caught for 290 yards last season and had three touchdown receptions. Nelson rushed 340 yards and had three touchdowns in junior college last season. On the offensive line, Simon Fraser has been bolstered by junior transfer Tyler Wood and sophomore transfer Reuben Buchanan who are joining sophomores Devin Pott and Brayden Gatland, the 2018 GNAC Freshman of the Year. The team also has a trio of talented tight ends in returning sophomores Christian Philips, Liviano Canil and Spencer McCabe, who played as a defensive end last year. Freshman quarterback Justin Seiber is expected to play a backup role to Richardson in hopes of becoming their future starter. Overall, Ford believes that his offensive unit has a multitude of players who can be gamebreakers, and he plans to utilize those who are making things happen. With a focus on run pass options, opportunities will be plentiful up and down the lineup. Simon Fraser will kick-off their season on Saturday, September 1 at home against the Division III Willamette University Bearcats. Admission is free for all SFU students and staff with a valid ID card available for presentation at the Terry Fox Field gate. The opener will include entertainment, inexpensive food options and free access to the SFU climbing wall.